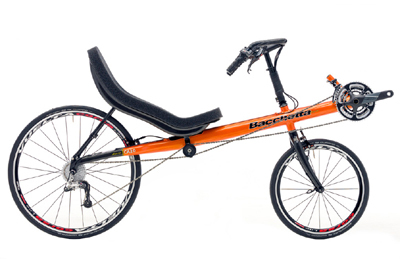 The Bacchetta Giro 20 applies Bacchetta’s design vision to an accessible steel frame bike for rugged touring and commuting use. The Giro 20 comes in chomoly steel version with a variety of upgrades available from Bacchetta. 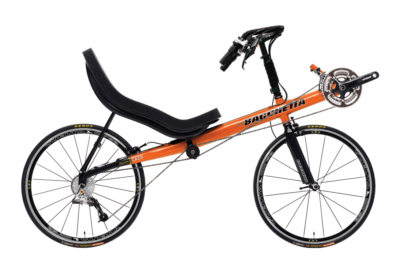 The 20″/26″ wheel combination is the bridge between the high-performance “high racer”and a more practical short wheelbase bike. 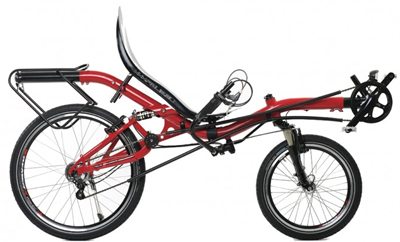 The smaller front wheel lets the frame and cranks sit lower, making for an easier step-over when mounting and dismounting, as well as a smaller step between the ground and the pedals. The smaller 20” front wheel is naturally tougher than the larger wheels on the high end models, and the rims are sized to allow for bigger tires. These bikes are aimed more at practical riding rather than all out speed. 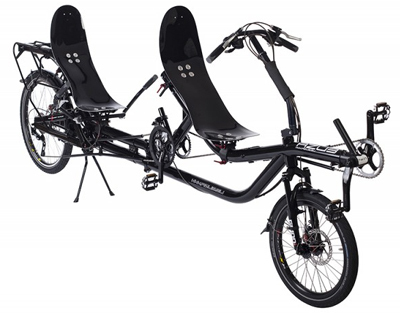 The Giro 20 is your first step into the reclined sort of speed bike. When you come in to test ride, we don’t put you on a Bacchetta first. Once you’ve taken a Lightning around, we’ll get you used to balancing in a more reclined position. You will also explore steering with Bacchetta’s open cockpit style of handlebar. 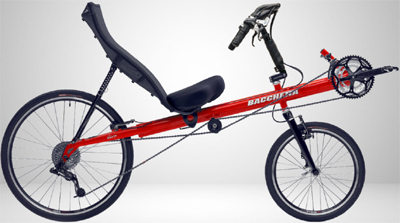 Bacchettas were made to go fast in a straight line, this style of bar is more comfortable for the long haul, and more aerodynamic, but tight manuevering is more of a challenge. You have a choice of three seat styles from Bacchetta. The classic ReCurve seat (pictured) is better for upright positions and people with larger hips. The innovative EuroMesh seat is ideal for smaller riders and deeper reclines. For highest performance, the Carbon shell seat is the lightest and stiffest. Any model of bike can mount any seat. Our price (subject to change): $1700. Disk brakes add $150. A word about our Giro line of short wheelbase recumbents… Giro means tour in Italian and that’s the mentality we built these recumbents around. Tough bikes that handle extremely well and can be loaded up for the long haul or the hectic, everyday commute. In short, our Giro line is about dependability. If you want a “do all” bike, check out our Giro lineup and see why it’s the Gold Standard in short-wheelbase touring and commuting recumbents. Crankset FSA Tempo (50/39/30T) - A triple crankset geared for climbing and carrying more that maximum speed. 170mm on short frame, 172.5mm on large frame. Bottom Bracket FSA, BB-7420ST (square tapered) - Nothing out of the ordinary on a bicycle part most people never think about. Front Brake MOYON long reach V-Brake - A brand you've never heard of, but they work fine. 26" - Elevated cranks relative to the seat, as you'd expect on a performance short wheelbase. Seat Height 24" - Seat height actually changes as the seat is moved on the frame for leg length adjustment. Ironically it gets higher up the shorter you are. We'd reckon seat heights range from 23 - 25" . Wheelbase Small: 47", Large: 49" - This is the distance between the wheel hubs. 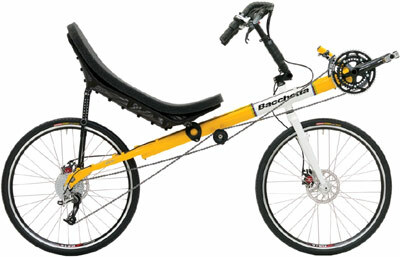 Weight 31 lbs - This is weight without pedals and with the Euromesh seat. The ReCurve seat adds about 2.5 pounds. Weight Limit 275 lbs. - Total of rider and gear. Gear Range 21.6 - 111 - If you plan on big hills, big loads, or old knees, get the low gear adjusted down. The high gear isn't up with the racing bikes, but it will get you down the road. Frame Size Small: 11.5" Boom, Large: 14" boom - This is not a very important metric. But if you are trying to determine what size frame you have then this is the easiest to measure. The "boom" is the part of the frame that runs from the headset (steering axis) out to the crankset. Measure from the middle of the head tube to the middle of the bottom bracket shell. X Seam Small: 33"-45", Large: 42"-52" - See our guide on how to measure your ex-seam.